The political capital of Macedonia, Skopje is the country’s cultural center as well and has been for over a full millennium . A city of seven hundred square miles, with a population of around half a million, Skopje’s monuments reflect and celebrate a rocky and religious heritage. Skopje, the largest city and capital of Macedonia attracts most visitors, and it's easy to notice. The city can offer something for everyone's taste, from shopping malls and centers, ballet and opera, cinema and theaters, to one of Macedonians favorite pass time activities, drinking lots and lots of coffee in the best coffee places in the city center. Located between seven mountains the outdoor activities are abound and many to choose from, skiing, hiking, canoeing, trekking, climbing, mountain biking all within an hour drive. Skopje is a dazzling city with a rich history.. As a part of the Roman Empire, it was also known as the name of Scupi, that meant "look out." It was captured by the Ottoman Empire and for five hundred years of Ottoman rule it was known under the Turkish name Üsküb or Üsküp. The city's personality changed immensely during that period. The Ottomans brought the Islamic religion and built many mosques and other classically Ottoman buildings, such as public baths and travellers' inns, some of them still exist today. During World War II this city was handed to fascist Bulgaria by the occupying German army and the Macedonia question has haunted many Bulgarians ever since. The city developed quickly after World War II, but this trend was abruptly interrupted in 1963 when it was devastated by a destructive earthquake. Today Skopje is a modern city with a wide range of cultural monuments. Skopje presents visitors with some magnificent and fascinating sites and one must-see is the church of Saint Panteleimon, an awesome example of the Comnenian royal art in a Byzantine style. This church is enriched with fabulous 12th century architecture commissioned by members of the ruling Comnenus royal family. An unforgettable site is the Mustapha Pasha Mosque, that is undoubtedly one of the most beautiful buildings of Islamic architecture in Skopje. Positioned on a hill facing Fort Kale, that mosque overlooks the city. It was built in the last decade of the 15th century when the military spahi system of Turkish feudalism had reached the peak of its development. Mustapha Pasha, an important figure in the Turkish state during the rule of Sultan Bayezid II and Sultan Selim I, donated it. The year of Mustapha Pasha's death is engraved on the entrance of his tomb, that is located by the mosque, but both were seriously damaged during the destructive earthquake. Restoration work however has reestablished the mosque and tomb to their former glory. The interior of the mosque is decorated with calligraphic inscriptions with the names of Allah, Mohammed and his followers and quotes from the Quran. The Millennium Cross is another modern must-see sites located on the peak of the Vodno Mountain. The cross was finished in July 2007 and is a massive 66 meters high, that makes it the largest cross in the world. It can be seen from 30 km away. 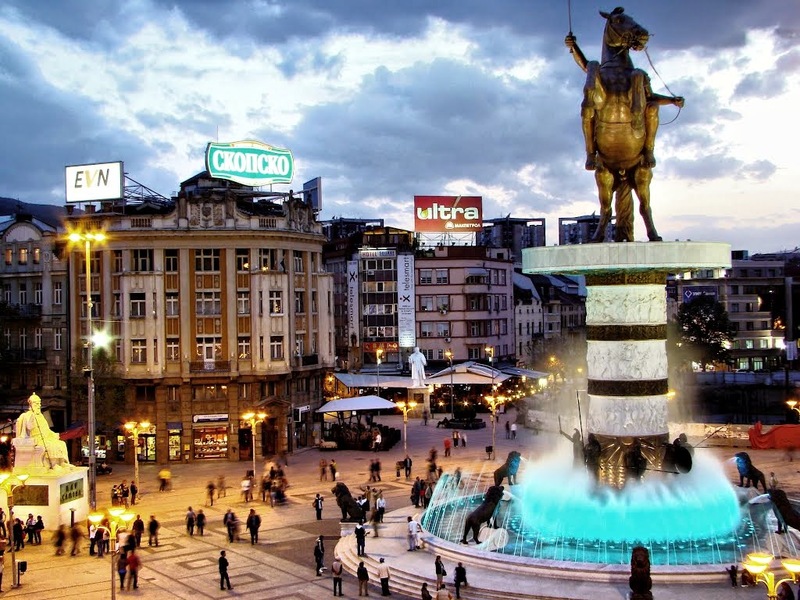 Skopje has an abundance of shopping malls and boutiques, that will satisfy the needs of the most demanding shopaholic. Gradski Trgovski Centar is the main shopping mall in Skopje. It is located in the city square and filled with clothing shops, restaurants and libraries. It has four levels where you can buy some branded clothes in some of the bigger outlets such as Mango and Happening. You can find something interesting in some smaller boutiques like VIP, Emporium or Baba Lu. The mall is really convenient and if you're not enjoying trudge round the shops, you can find everything you wish here. Skopje thrives with excellent restaurants, serving traditional food, as well as restaurants where you can taste Chinese, Italian, Mexican, Greek, Arabic, Indian, or Spanish cuisine. There are also plenty of fast food restaurants with a wide selection of snacks. Meals in international restaurants cost around 18 Euros per person. Meals generally tend to be long affairs where the food and drink are seen to be less important than the conversation and company. Popular dishes include Russian salad and meat with minted rice. Downtown Skopje is packed with cafes and bars including some fun specialty. Recommended restaurants include Uranija, Tri Biseri, Kamnik and the Gino Italian Restaurant. There are plenty of places to stay and a variety of price ranges according to all budgets. The Aleksandar Palace Hotel is one of the most expensive one at 187 Euros a night but it is the best in Skopje.They offers guests a large casino, tennis courts, amazing room service and great food. The Imperial Hotel offers comfortable accommodation and first class service. One of the best things is that it is very quiet and you can get a good night sleep for the price of 35 Euros a night. So have you ever went to skopje,the dazzling capital of macedonia?If yes then do share your view about it and if no then are you willing to take trip to skopje? Wow, really, this helps me a lot to understand about this place, Skopje. I think more tourists are coming for sight-seeing with its grandeur. ahhh,., one of my travel dreams!! This is awesome. This place really a must visit place because of it's rich history and fascinating architectures. I am an avid fan of churches, really amazed by churches designs and structure. Jeez... you woke up my I-wanna-be-a-travel-blogger-now! dream!!! Skopje looks like a really interesting place to visit with its rich heritage.